is a professional association for individuals responsible for generating philanthropic support for a wide variety of nonprofit, charitable organizations. Our Chapter offers networking, education, and other professional development opportunities for our members. AFP advances philanthropy in society by enabling people and organizations to practice effective and ethical fundraising. The core activities through which AFP fulfills this mission include education, training, mentoring, research, credentialing, and advocacy. AFP members and affiliates enable people and organizations to better serve diverse communities and the Association as a whole. 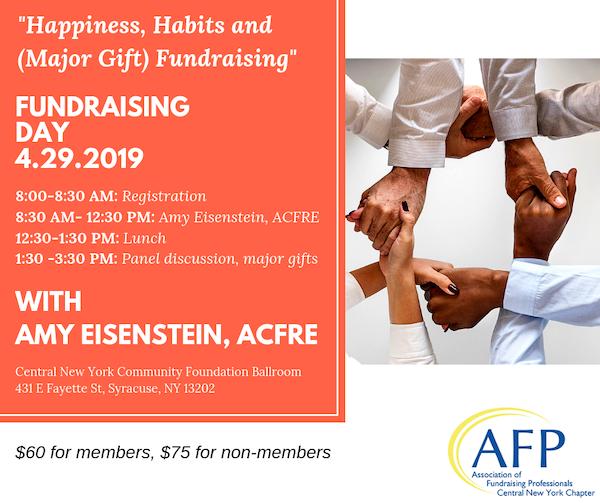 We welcome fundraisers from the counties of Jefferson, Lewis, Oswego, Oneida, Herkimer, Madison, Onondaga, and Cayuga to join us as members or affiliates. 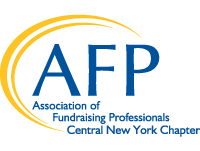 We also welcome fundraisers from Chenango, Cortland and St. Lawrence as well as all contiguous counties who are seeking to join the Association of Fundraising Professionals and find our chapter best serves their needs.